Why does it get dark quickly in the winter? How do you make a flashlight light? Children raise such questions all the time. They are naturally gifted with a sense of Wonder and Curiosity. 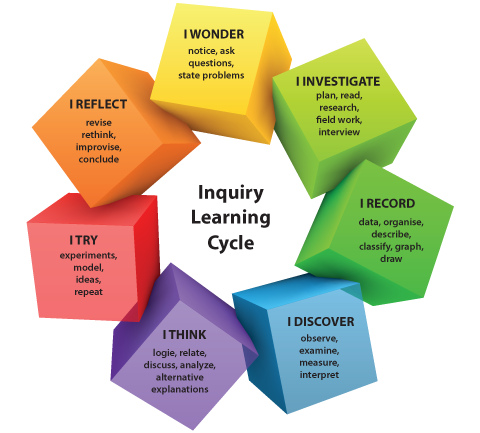 Inquiry-based learning is teaching by linking to children's natural curiosity. Our traditional educational system has worked in a way that discourages the natural process of inquiry. It is focused on "Mastery of content and knowledge". Students learn not to ask too many questions, instead to listen and repeat the expected answers. The role of the teacher is that of an information giver and the students are passive absorbing an overload of facts and information. At Redbricks, through "Inquiry-based Learning," Students are involved in the construction of knowledge through active involvement. There is more emphasis on "how we come to know" compared to "what we know." Effective inquiry is more than just asking questions. A complex process is involved when students attempt to convert information and data into useful knowledge. Due to this method, students develop - An In-depth Understanding, 21st century Skills, and a Strong Motivation To Learn. Through Inquiry-based learning, children are actively engaged in the process of learning. They raise questions and find out answers to their questions through multiple methods. The representation of their thoughts and ideas are also done in multiple ways through writings, verbal discussions, drawings, graphs, charts, models, exhibitions, etc. The teacher is an important guide and co-learner in this inquiry-based learning process along with children. 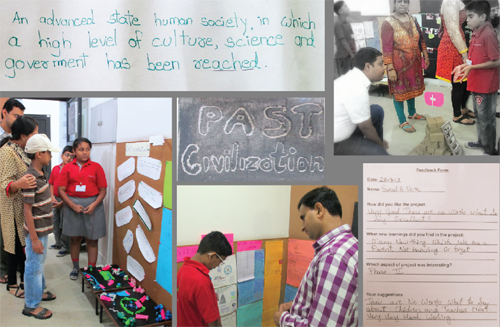 ON THE THEME OF "PAST CIVILIZATIONS"
We initiated a Project with our students on "Past civilizations" as an important social science topic. During the initial week, we asked various questions to children about past civilizations to know their understanding level, misconceptions and curiosity on the topic. Children talked about the life style and town planning in past civilization. They were confused about early men and past civilizations being the same. They shared information about people being less creative and naive at that particular time. Children were very curious about the kind of food, culture, occupations and recreational activities of people at that particular era. They created a question bank listing the queries they had about past civilizations. These questions were used to plan for further investigation and research. Children now started their investigation on the lifestyle of people. They divided themselves into groups and started researching on the occupations, clothes, food and currencies in past civilization. They browsed through Internet and books and created a research document on the ancient river valley civilizations. They also collected various pictures through Internet. We visited "Lothal" which was one of the most prominent cities of the ancient Indus valley civilization (dating from 2400 BCE). 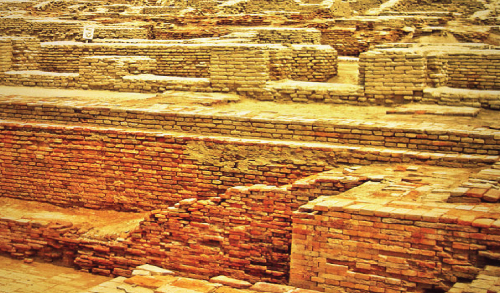 It was discovered in 1954, and later excavated by the Archaeological Survey of India (ASI). Children closely observed the ancient artifacts & also visited the excavation site to see the town planning of the Indus valley civilization. They saw the foundation structure of lower town and citadel. They also saw the warehouse, bead factory, cemetery and the dockyard. 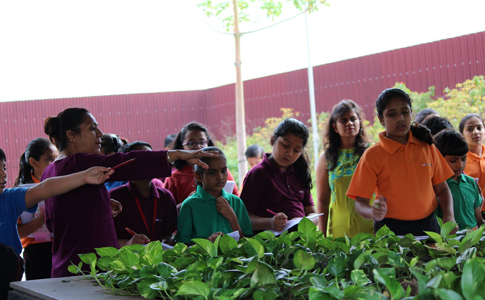 It was interesting for them to see the drainage systems created in that particular era and how it was used till date. Children took various measurements at the site related to area and perimeter. They also made representational drawings and recorded various findings in writing at the site. The students took on the role of researchers while finding out details about the past civilizations. They browsed through Internet and used a variety of books. 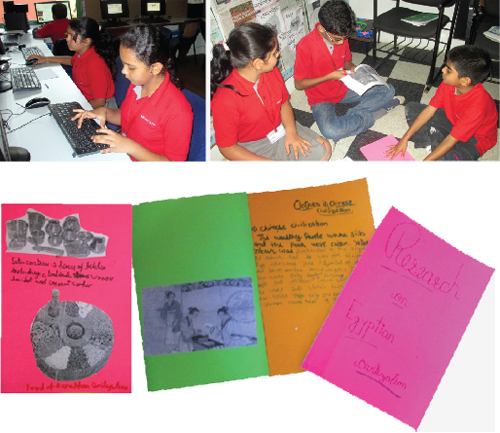 Then finally they created research booklets on the lifestyle of each civilization. These booklets carried information about lifestyle of people in past civilization. It talked about the kind of food they ate, the occupation and recreational activities they did, the currencies they used and the clothes they wore. Along with the information, students also collected images and put them on the document for more clarity on the topic. The discoveries about town planning in the past civilization amazed the students. 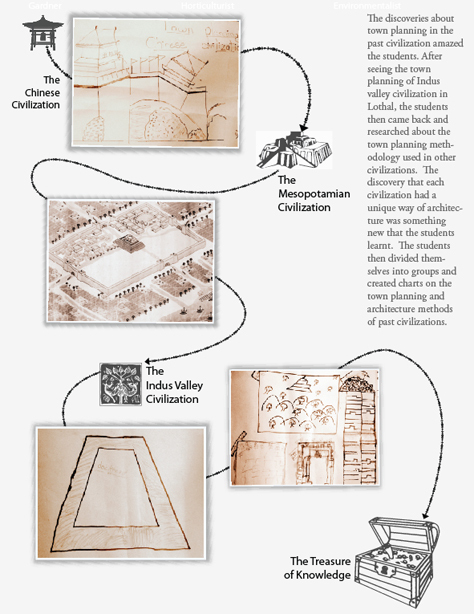 After seeing the town planning of Indus valley civilization in Lothal, the students then came back and researched about the town planning methodology used in other civilizations. The discovery that each civilization had a unique way of architecture was something new that the students learnt. The students then divided themselves into groups and created charts on the town planning and architecture methods of past civilizations. While finding out the information on past civilizations, the linkages between past civilizations to the present day society left students thinking about how much we have borrowed from our past. 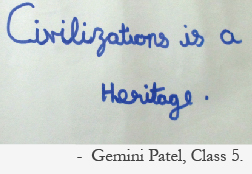 With this thought in mind, students started exploring to find out how much influence of past civilizations are being used in the present day society. A single thought process led to the discovery of facts like flower vases, pots are still being used. Games like chess, tops and ludo are still being used. Weights used in past civilizations and today are similar. Their architecture influences lot of our cities even today and the drainage system is a clear example of it. To finally showcase their learnings, students decided to create replicas of the major artifacts of the major four river valley civilizations. 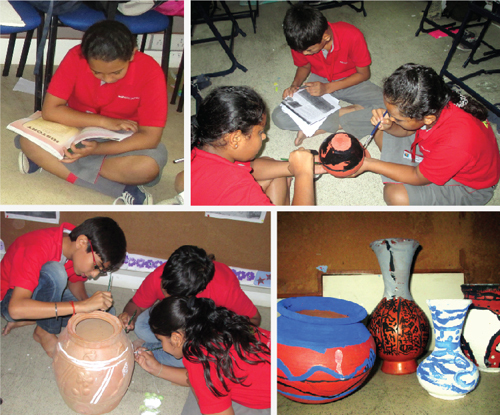 Students brought pots and painted on them the kind of painting, which was done in past civilizations. They chose a famous jewellery piece from each civilization for eg, the Chinese hairpin and created small models of it. They also had found that the seals were the most important artifact of each civilization, hence they carved seals on soap bars. The script of each civilization was found to be different which was also depicted in an innovative way. Another important aspect of past civilization was the architecture, for which the students created models of ziggurat, the great bath, pyramid and the silk route of china. At the end of the project, students reflected on how much knowledge had they gained. 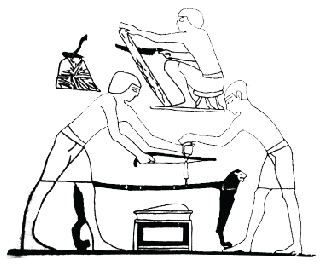 They had cleared many of their misconceptions about the people of past civilizations & acquired life-long understanding. Students decided to hold a project exhibition display for their parents and students of entire school. The exhibition was entirely planned and put up by the children, showcasing their learning journey from the project. 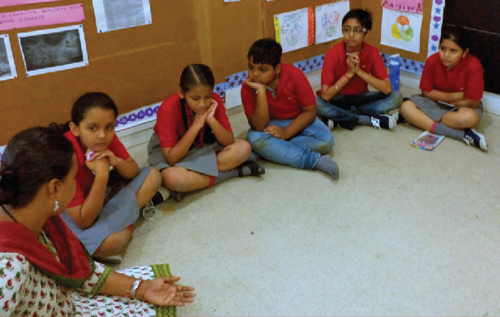 Through this project, children learnt about various subjects in an integrated manner.